Out making memories with dad. Growing up as a North Side Chicagoan, baseball was part of life. My father being a die-hard Cubs fan, there was always an expectation for both enthusiasm and patience when cheering on our local “dream team” come summertime. As a family of Cub fans, we spent many long hours together within the friendly confines of Wrigley Field. From this, my sister and I learned many valuable lessons. There were the obvious ones of course, like “keep your eye on the ball,” and “always re-apply sunscreen when sitting in the left field bleachers.” Then, there were life lessons. The ones that my father, especially, would bring up time and time again. Of those, one lesson stands out in particular. You win some, you lose some, and some are rained out. What does this have to do with skiing and snowboarding? Simply put, everything. Whether applied to your personal on-snow experiences, or those shared with your kids, I find so much value to this phrase. See, when we would go to a ballgame, it wasn’t about the Cubs. Well, maybe for dad it was, but for my sister and me, it meant so much more. From the moment we’d wake up in the morning, we knew it was going to be a special day. We’d talk to one another about hoping to make it onto the TV broadcast— “look for me, I’ll be chewing gum!” We’d share fond memories of games past, and even the vibe on the train was special on a game day. It was the whole experience that made these memories so great. Sure we got to spend plenty of time with dad outside of the ballpark too, but those memories were unbeatable! Everything from the smells to the sounds, even the times when dad would argue with the other fans over whose pitching was garbage and who was a real gem. Those memories were special. Those memories kept my head in the game of life. Rained out, but still a win. Each summer, Smugglers’ top kids’ snowboard coaches head to Central Park in Manhattan for the annual Adventures NYC event. 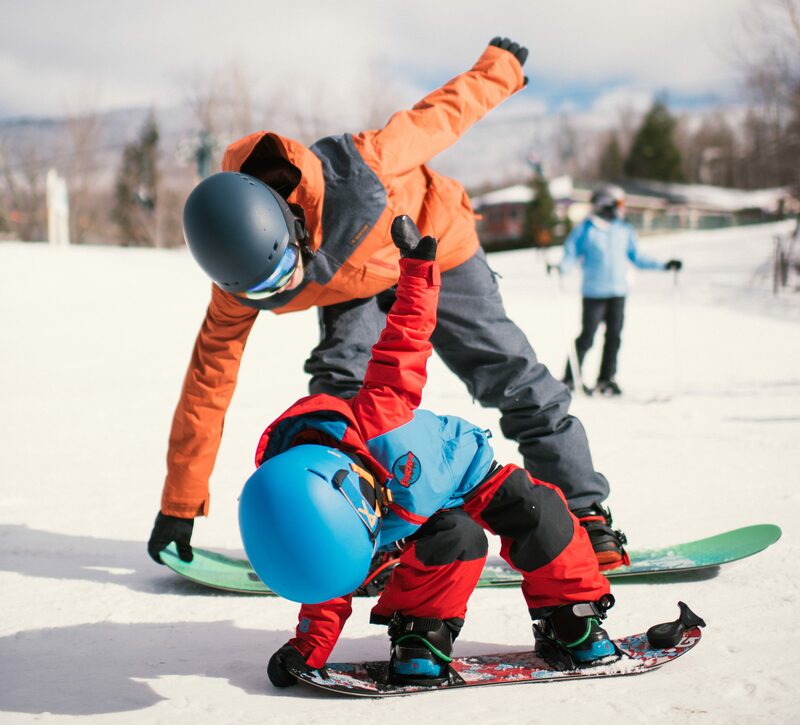 Now in our seventh year participating, we bring a Riglet Park setup to the city in hopes of sharing the snowboarding experience with kids up to about age six. It’s always a great time, but last year was a bit different. From right about the moment the parks department canceled the event due to Manhattan falling under a flood warning, I couldn’t help but think about my father’s famous words, “You win some, you lose some, and some are rained out.” Sure, we were soaked to the bone. Sure all of our equipment would sit in the van for the 6-hour drive home, wet and quickly becoming smelly like gym socks. But the experience up until that point was on a whole new level of fun. See, these kids who participated out there in the pouring rain, they didn’t care about getting wet. They were having fun. Their coaches set the tone for fun, and the kids followed. It wasn’t about getting wet or staying dry, it was about these kids coming out to try something new, making the most of it, and going home with some unforgettable memories. They will never forget that first time they got to stand on a snowboard in the pouring rain, in the middle of Central Park, in June. The lesson we can all learn from this experience is one we should carry with us every single time we come to the mountain. When heading out to the hill with young ones this winter, make this your mantra. Even if just going out for some turns on your own, keep this in your head. Whether it’s a powder day, an icy day, a windy day, bluebird, or a rainy one, it’s about the memories we create with one another. When your four-year-old shuts down after a mere fifteen minutes out on the snow, make the day into a memory rather than writing it off as a failure. Count your losses and head to the FunZone 2.0, grab a cone from Ben & Jerry’s, or simply reflect on the positives from the day. Your time on snow was fifteen minutes of sharing the greatest thing in the world with a very special little one. There’s no failure in that, for either party involved.